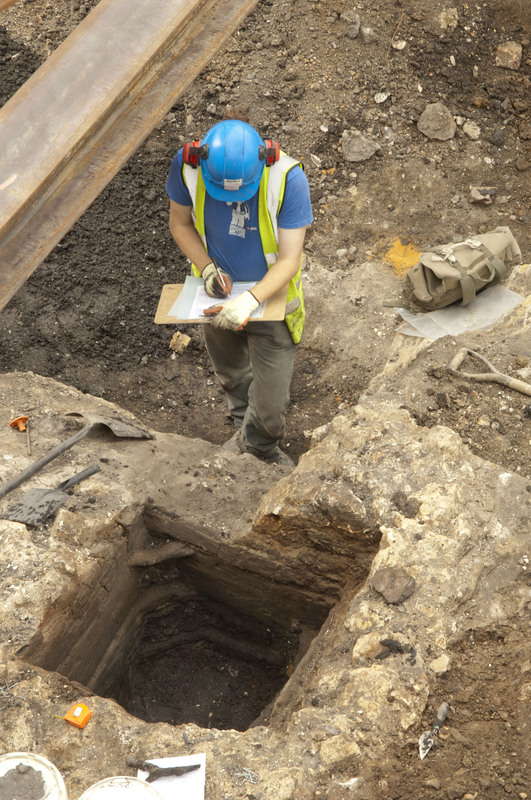 One aspect of Roman London that our archaeologists have had no trouble comprehending, as they slogged through this week’s rain, is that water was never in short supply. The ancient city was centered on two freely draining gravel hills which in turn sat on London clay. When the rain drained through the hills and onto the watertight clay, it was forced to flow outwards, forming numerous springs and streams. These spilled downhill into the Thames’s many (now hidden) tributaries; the most important of which was the Walbrook, which ran between the two hills bringing clean water to the citizens of Roman London. This is why Londinium never needed one of Rome’s famous aqueducts. Instead, wells and cisterns proliferate across the city. 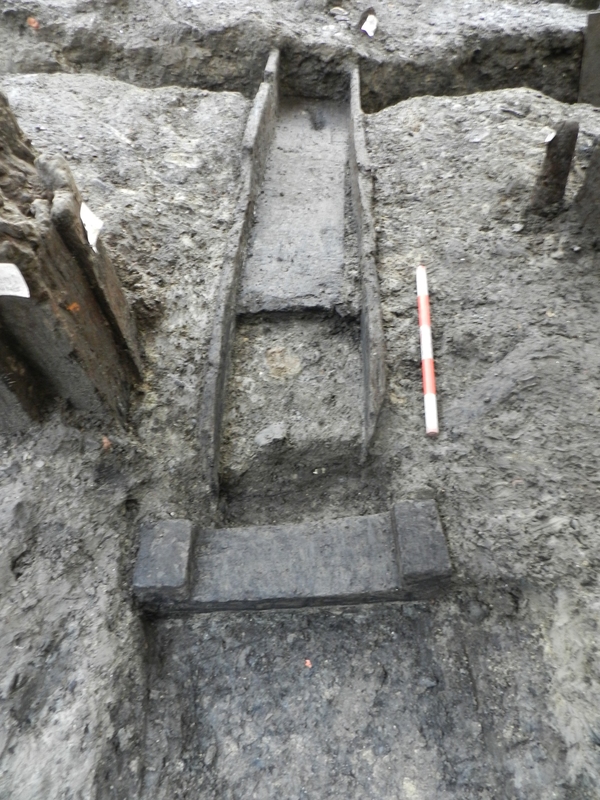 For example, this is a well-preserved 4th century timber box well, which has both a timber lining and a chalk cap, which may be the remains of a well-house or the base of a lifting mechanism. The struts in the corners seem excessive for keeping the structure together, and it is thought that they may have doubled as ladders. With water in such abundance, a pressing concern for the people of Roman London would have been how to remove water that they didn’t need. And because the ground has remained waterlogged since the Roman period, we can see how. 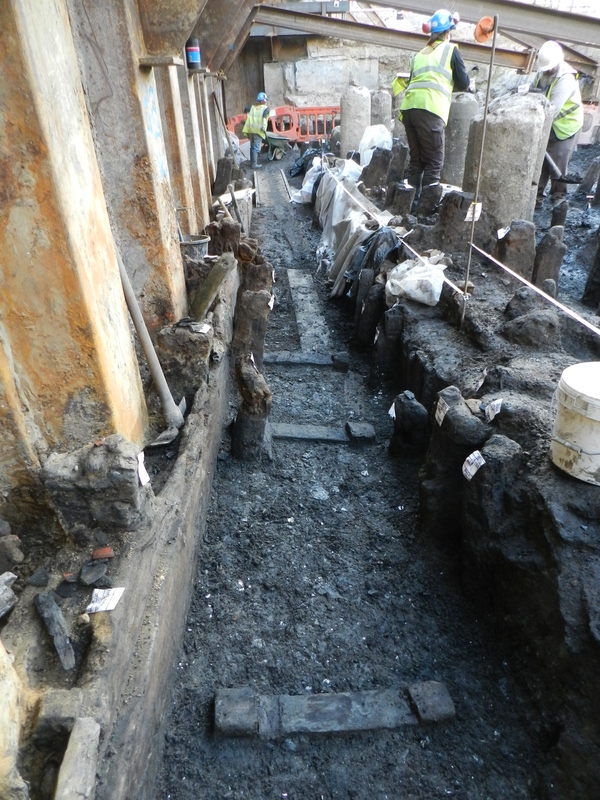 Timber drains run across our Walbrook sites in all directions. Some, such as these two, even join up. The substantial survival of these drains is remarkable considering their age. 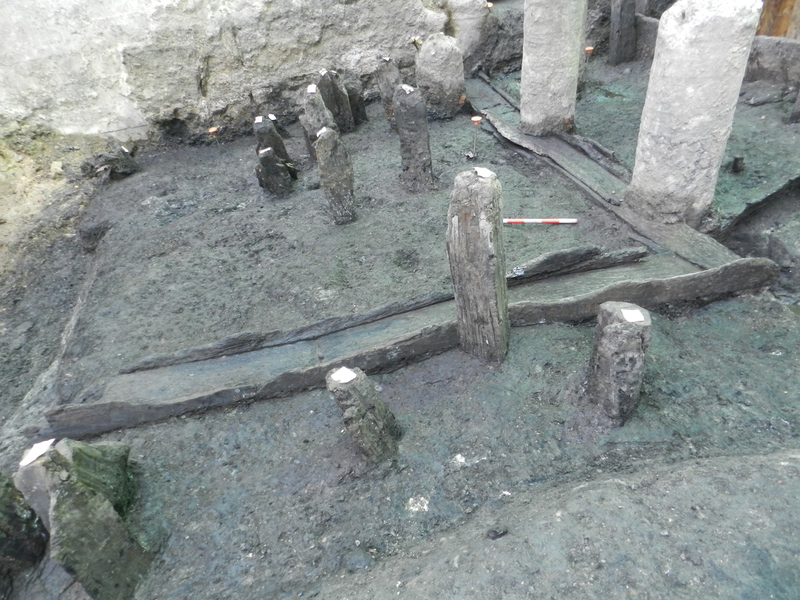 They are made up of long base planks which sit on wooden saddles and would originally have had wooden covers, although most of these were removed when they were abandoned, and would have been buried beneath the streets. 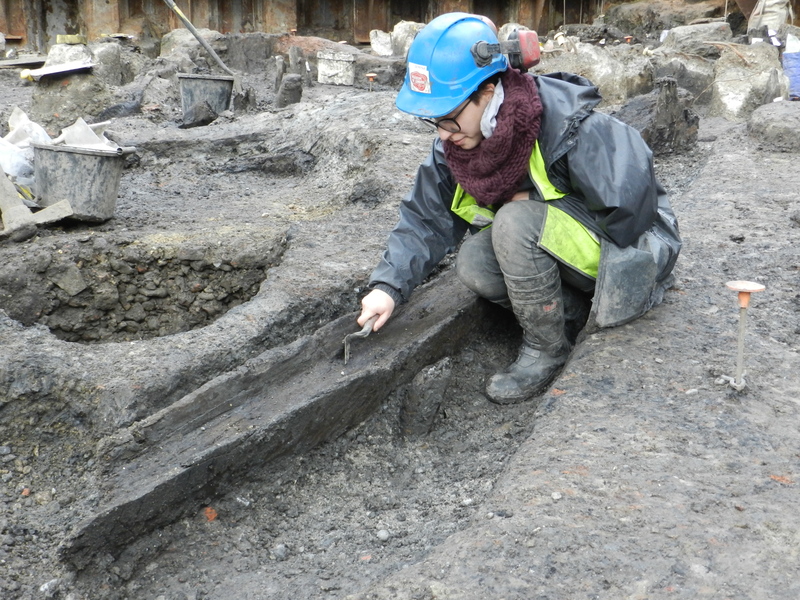 One particularly impressive base plank measures almost five meters long. 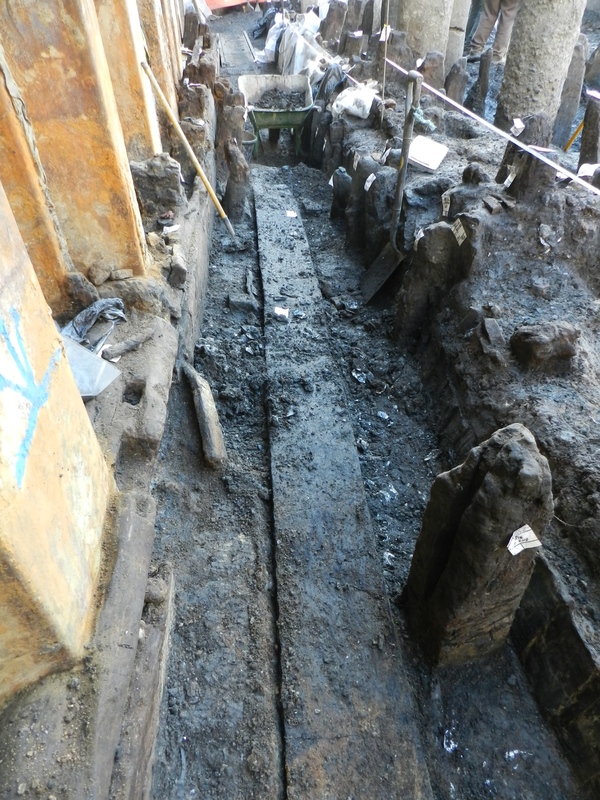 Intriguingly, some of these drains don’t lead towards the Walbrook, and instead appear to be associated with a heavily truncated timber building, potentially suggesting an industrial use. Whatever the explanation, a few more drains certainly won’t go amiss as winter weather rolls in.